Give the machines a leg up! The rise of the machines doesn’t sound like science fiction to me anymore. Many of us will remember a time in our career before cell phones and emails. Now we hear of semi-autonomous drones and self-driving cars -- technology is advancing at an eye-watering rate. And with these advances come the naysayers and their apocalyptic predictions: if you don’t get run over by a self-driving car, or accidently bombed by a drone, at the very least you are likely to lose your job to a machine. Indeed, last year the Bank of England’s chief economist, Andy Haldane, said that almost half of the UK’s workforce, or 15 million jobs, could be replaced by increasingly clever machines in the next 20 years. Machines have already disrupted our status quo, and will continue to do so in the future, accept it. But perhaps we can use this to our advantage. Toby Walsh, professor of artificial intelligence (AI) at Australia’s University of New South Wales is incredibly upbeat about the value that robots can bring to the workplace. His view is that the machines will take over the boring, repetitive, mind-numbing or dangerous stuff. And they will do this work better than we can, for longer, without getting tired or making mistakes, 24/7, every day of the year. Take Aussie mining company Rio Tinto. Last year two of its mines became the first to move all their iron ore using remote-controlled, driverless trucks. The 22 trucks on the fully automated mines, plus another 47 trucks on other mines in Western Australia, are controlled from Perth, more than 1,000 kilometres away. The trucks run 24 hours a day, and 365 days a year, don't take bathroom or lunch breaks, and crucially, don't become fatigued in a high risk environment. Rio Tinto says this is saving them 500 work hours a year. And while presumably the original (human) truck drivers were redeployed, the mine struggled to recruit remote control operators. Hardly surprising, seeing as the job didn't even exist a few years ago. Walsh concurs, saying that, as with the Industrial Revolution, the digital revolution will both destroy and create jobs, but this time white-collar jobs are also at stake. This trend is not new: since 2000 productivity is up and employment is down. Two things are likely to happen: one is that a computer will replace you, or alternatively, you’ll use a computer to do your job better. Why is Walsh upbeat though? Drawing a parallel with the socio-economic improvements brought about by the Industrial Revolution: shorter working weeks, social welfare and so on, today we have the chance to redefine our working lives, freeing us up for other things, including the lifelong learning that we’re going to need to thrive in the ever-changing, digital economy. I think this starts with forward-thinking, adaptable individuals. Just like businesses are being told to disrupt themselves before they get disrupted, we professionals need to enter a personal disruptive space. So why not take matters into our own hands and start to automate the repetitive, boring part of our jobs, freeing us up to think creatively and strategically. Far more than getting the job done every month, this is where we can really add value. Let’s take a look at the finance function. We have the opportunity to make a massive step-change in roles and responsibilities, taking the finance role from bean-counting operational stewardship to becoming a change agent and driving strategy in the organisation. You can begin today by starting small and keeping an open mind. You don't need to get things right first time, as long as you learn from each experiment. Is there one day-to-day task that you can automate today? Do so and see what happens. This will give you the opportunity to free up capacity by shifting and automating operations, giving you the time to run the analytics needed to practically predict the future, and smooth out the processes to ensure you stay efficient and productive in the future. Then, is there one skill that you’ve been meaning to acquire to take your career forward – ideally something that the machines can’t replicate, so probably involving creativity and emotional intelligence? In today’s world you need to keep learning: our one-size-fits-all education system is a massive mismatch with a fast-paced, digital world. Keep testing and experimenting with new ways of doing things, and you’ll set yourself up to peek around the corner and shape the future of your organisation. 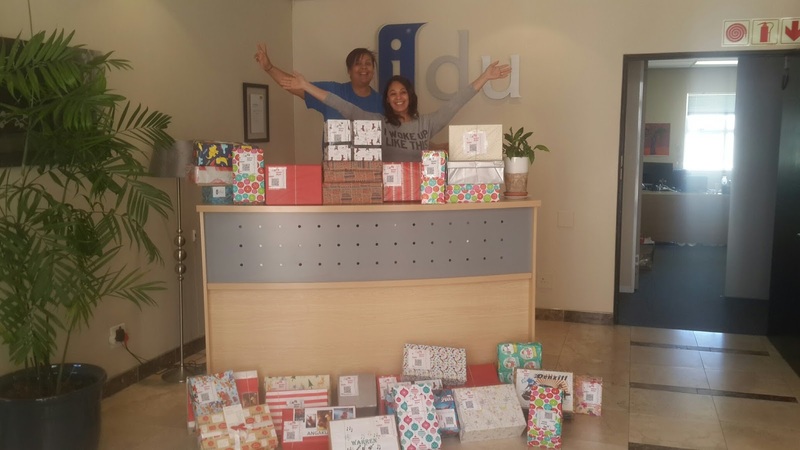 It is hard to believe it is that time of year again already – for us it is the time when the IDU team support the Santa Shoebox Project, and this year we pledged more boxes than ever before. For those who don't know what the SantaShoebox Project is all about; it is an amazing initiative that began in Cape Town 10 years ago. That first year, the Project collected 180 shoeboxes for children in orphanages, children’s homes and care centres locally. In the past 10 years the project has delivered 551 979 boxes to underprivileged children across South Africa and Namibia. 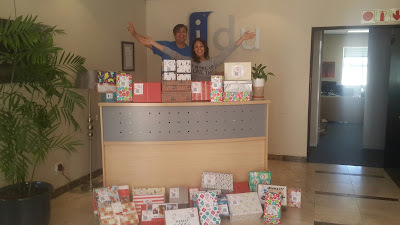 This is IDU’s 6th year participating; we encourage all our staff and our customers to get involved in any way they can and we personally delivered the shoeboxes as a company, to the drop off centre at the Cape Town Convention Centre. Some of our team members also volunteered their time to work at the drop off centre, where they received more than 66 000 boxes in one weekend. We really love that this project is so personal, allowing our team members to choose whether they want to spoil a boy or girl, a baby or a teenager; that we can learn the child's name and shop for items with that specific child in mind. I think it makes it more special for the children as well, knowing they were specially chosen and everything was bought just for them. It’s an evergreen problem: graduates have the qualifications but not the experience to find jobs. Back in 2012, there were more than 600,000 graduates unable to find jobs and not being able to use the skills they have learnt, according to Adcorp’s December Employment Index. Then, add into the mix that IT skills are in short supply, and are essential to fast-track South Africa to a knowledge economy. Ironic, isn't it? Backdrop this against StatsSA figures for the first quarter of this year, which show that South African youth experienced an unemployment rate of 37.7%, far higher than the total average of 26.7%. How do you resolve this catch-22? South Africa has no shortage of talent, but this needs to be converted to reliable, practical skills. Partnerships with the private sector are increasingly important to give graduates the essential work experience and practical on-the-job knowledge needed to land their first job. This is where internships add real value as they provide the opportunity for graduates to gain practical experience in their field of study, as well as improving their chances of obtaining full-time employment. In addition to upskilling and training the graduates in their relevant field, internships teach a range of other skills essential to being effective in the working world: from company etiquette, to time management, and team-based working. All the things not covered in text books and which generally first-time employees muddle through. For companies, internships are also a great way to employ junior developers. For instance, at Westlake-based IDU, we currently have several interns from The Cape Peninsula University of Technology (CPUT), recruited via the Centre for Community Engagement and Work Integrated Learning (CCEWIL). On arrival at the four-month internship, the interns are paired with a developer and coach to support them and guide them as they gain experience in IT business analysis and software development through involvement in real projects. Nadir Isaacs, an intern at IDU, says: “Since joining IDU, I have gained the comprehensive knowledge of business and systems processes within an IT-based environment. This industry exposure has helped my analytics skills and business processes. Doing analytics is not about understanding concepts from a book, rather it is about understanding consumer behavior, situations and how to run a business system. “At IDU, I have been given an opportunity to work on real projects and to meet specific deadlines. We are taught to use our creativity and initiative when completing a project. It helps to be goal-orientated in this environment and I have received loads of encouragement and support from the development team mentoring us. 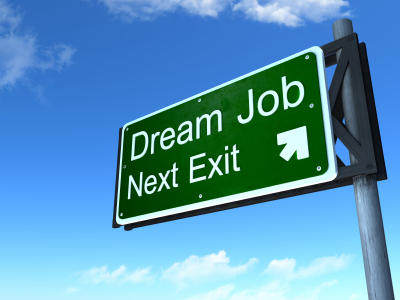 Over the past twelve years, almost all interns at IDU have gone on to join the company on a full-time basis. Nadir has been offered a permanent position at IDU from December 2016 and we are confident he will be a valuable member of the team going forward. The IDU team are in Johannesburg on Wednesday 12th October, come and see us! We invite IDU clients and business partners to join us for a breakfast update session next week on Wednesday 12th October at The Forum Campus in Bryanston at 7.30am. We have over 40 clients attending so far and we look forward to sharing our development roadmap as well as our new features and functionality with you. Space is limited, and there are only a hand full of seats left. If you haven’t already replied and would still like to join us, please email rochelle@idu.co.za at your earliest convenience to reserve your spot.